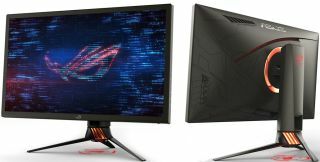 Asus is getting ready to throw down the gauntlet in the monitor category with its not-yet-official ROG Swift PG27UQ, a 27-inch display that checks off nearly all the boxes, including support for High Dynamic Range and Nvidia's G-Sync technology. The monitor is not yet official because Asus hadn't planned on announcing its flagship display just yet, though it's pretty much academic at this point. A leaked press release is making the rounds, but Asus need not worry: there is no thunder being stolen by the earlier-than-expected reveal. This is a hell of a monitor. In addition to pairing HDR and G-Sync, the PG27UQ is a 4K resolution (3840x2160) monitor with an ultra-fast 144Hz refresh rate on an In-Plane Switching (IPS) panel, meaning wide viewing angles and accurate color reproduction you won't find on a TN panel. "The LED backlight is dynamically controlled across 384 zones, enabling very high contrast for richer, more natural dark scenes. Quantum-dot technology provides brighter images and supports the cinema-standard DCI-P3 color gamut. DCI-P3 has a 25 percent wider color range than sRGB, resulting in more realistic colors," Asus explains. So to sum things up, this monitor boasts a premium 4K resolution panel with a fast refresh rate, HDR support, G-Sync technology, and quantum dot visuals. That's a pretty killer combination. There is an HDMI 2.0 port and two DisplayPort 1.4 ports for tapping into all that goodness. Some details are not included in the leaked press release, such as what ergonomic adjustments the stand supports (or doesn't support) and the price. We're guessing it's going to cost well north of a grand, but if this thing lives up to its spec sheet, it could end up as the gaming monitor to beat.